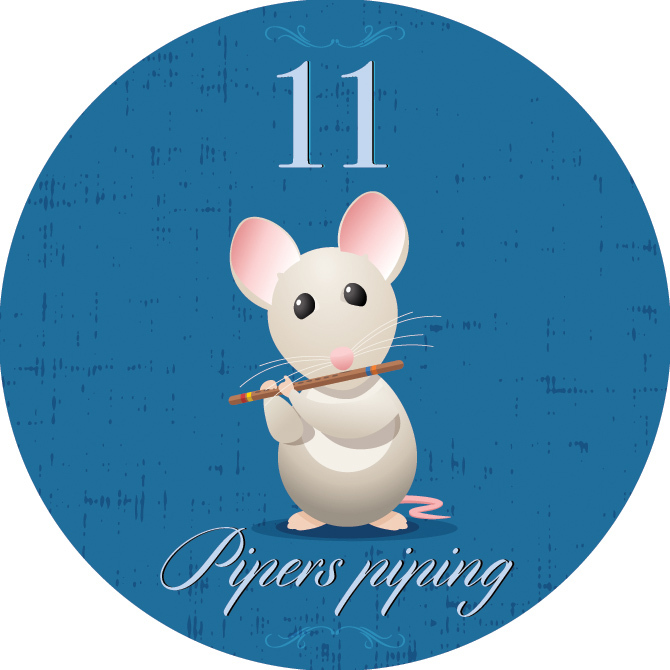 Welcome to Day 11 of my 12 Days of Christmas 2017. I am so glad you are here. If you have been following along for the 12 Days of Christmas 2017 posts you know that the theme of my 12 posts are about either thrifted, gifted or vintage Christmas presents that I am giving this year. 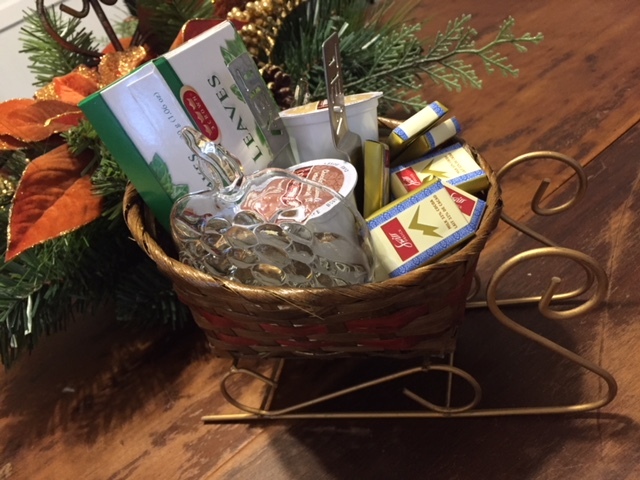 Today’s gift is a thrifted decorative sleigh filled with new and vintage items for a coffee or tea lover or both. 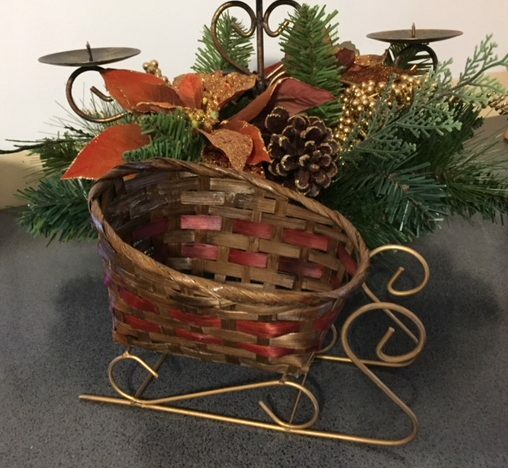 I found two of these decorative sleighs at a local thrift store for $1.25 (for both). I am currently using the larger one to hold the TV and DVD remotes on my side table as I am forever misplacing them. Oops, I digressed. 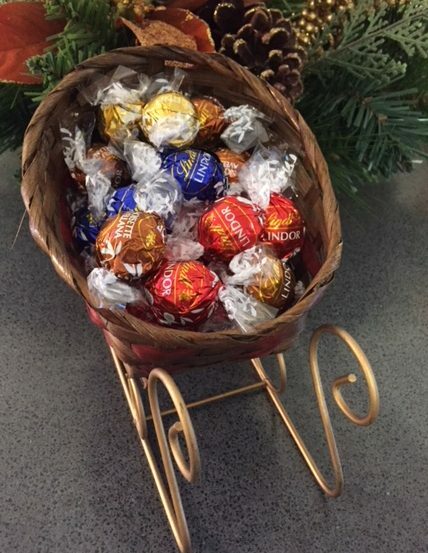 It would look great filled with Lindt chocolates, maybe the recipient will use it for a candy dish after they consume the tea, coffee and Swiss chocolates. I found two cute vintage glass tea bag holders and a set of “tea” tongs. I added a few Keuriq cups and a box of Peppermint tea and filled in the gaps with Swiss chocolate. I think this is the perfect gift for anyone on your list that enjoys, coffee, tea and chocolate. It’s been a great deal of fun showing you all the gifts I am giving this year, and I can’t wait to show you the final day tomorrow – be sure to come back for Day 12. Here is a recap from what you may have missed along with links to all the Wandaful Things I created last year (2016). This entry was posted in Decorate, DIY, Make and tagged 12, 12 Days of Christmas, chocolate, Christmas, coffee, Crafts, Day 11, Decorate, DIY, easy, gift, gifted, gifts, ideas, inexpensive, Keuriq, peppermint tea, recycle, repurpose, reuse, simple, sleigh, tea, thrifted, tongs, vintage. Bookmark the permalink.